A pearl white bus, with the Solid Ground logo painted on the side, pulls up to the Harborview Medical Center on the corner of 9th and Alder. As the doors slide open, the bionic whine of the wheelchair ramp greets us. The ramp does not discriminate between those who need it and those who don’t. Every passenger, whether able-bodied or living with disabilities, benefits from one fewer step to climb. This is the Downtown Circulator Bus – a free transportation service that drives a 30-minute fixed route in downtown Seattle. We drive from one side of downtown to the other. Pass the hospital. Pass the ACRS Food Bank, the Public Library, Pike Place Market. Pass the Department of Social and Health Services (DSHS). Every stop along the route was specifically chosen for the practical help it provides to people living on low incomes or who need access to health and human services. The driver, Joe, is easygoing and genuine. He’s humble about the service he provides, briefly commenting, “The people who use [the bus] can use the financial help.” But he’s careful not to put people in boxes, recognizing that the $2.50 Metro fare is “kind of a lot, for a lot of people,” and that working class people compose a significant portion of the riders. A lot of people just ride the bus – in fact, will take the whole route around – to get from the bottom of the hill to the top. The biggest issue for many people is the hills. I look around the bus to face an eclectic group of passengers. The high proportion of riders with injuries and disabilities creates an in-the-moment reminder of why the Circulator Bus is necessary – to get people the services they so clearly need. We pass the Downtown Public Health Center, the Community Psychiatric Clinic. Two passengers in the back chat amiably for 10 minutes before exchanging names and phone numbers. Passengers voice observations about the constant construction, the ever-taller Seattle. They notice things out their windows. A man named Dean calls me over by name. He overheard me introduce myself to the driver and jokes that Joe always tries to hit the potholes. He asks me about my hometown, and shares how important the Circulator has been for getting him to his appointments. His warmth shakes me. There is a certain humanity here not present on the average Metro bus. We round out the 30-minute trip on Boren Ave, passing The Salvation Army. Soon we’re at the hospital where we started. He tells me how positive his experience driving the Circulator Bus has been. I believe him. He shares that his mantra is to just keep driving. I think we need him to. Transportation Levy to Move Seattle: The City wants to hear from you! Posted on March 27, 2015 by Gordon McHenry, Jr.
Transportation is critical to the health and well-being of our community. 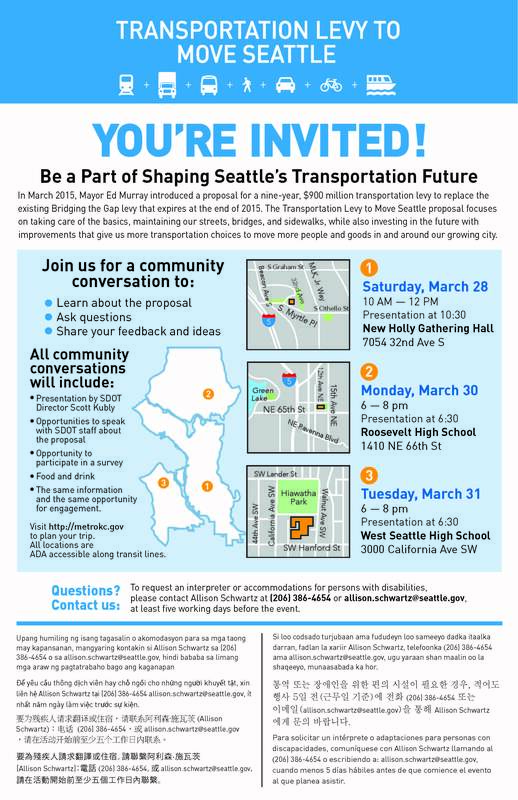 The City of Seattle would like to hear the public’s feedback on the Transportation Levy to Move Seattle proposal and is encouraging community members to learn more and get involved in a number of ways. Some background: In March 2015, Mayor Ed Murray introduced a proposal for a nine-year, $900 million levy to replace the existing Bridging the Gap levy that expires at the end of 2015. The Transportation Levy to Move Seattle proposal focuses on taking care of the basics, maintaining our streets, bridges and sidewalks, while also investing in the future with improvements that give us more transportation choices to move more people and goods in and around our growing city. Appreciate your transit drivers TODAY! March 18 is Transit Driver Appreciation Day, and Solid Ground wants to take a moment to do just that. Our Solid Ground Transportation (SGT) employs 107 ACCESS van and Downtown Circulator Bus drivers who work diligently to make sure that people who struggle to ride the regular King County Metro bus system have safe, reliable transportation to medical appointments, and can stay connected with family, friends and their community. THANK YOU to all of our fabulous drivers! Here are just a few fun facts highlighting the amazing work that the SGT team achieves, and don’t forget to appreciate your bus or transit driver today! SGT ACCESS drivers transport over 300,000 riders each year. SGT is the only nonprofit organization providing ACCESS service for King County Metro. All SGT drivers are required to complete approximately 22 hours of training every year. Drivers are only given seven minutes to board and secure a passenger using a wheelchair or scooter. The Solid Ground Circulator has provided over 130,000 rides to date. Drivers are given only 15 minutes before their route to check 86 items on their bus before departing the lot. Drivers are required to recertify every two years in CPR/First Aid, Smith System Defensive Driving and Passenger Safety and Security. Drivers are required to flex their regular start times + or – 60 minutes and must check for their next day’s start time every night after 7pm. They could start as early at 3:45am! Much like postal workers, all SGT essential employees are required to show up for work, even in snow, rain, extreme heat and the gloom of night! SGT operates up to 90 routes daily, nearly 24/7, 365 days per year and do that all with just 6 dispatchers, 7 supervisors, 8 technicians and 107 drivers, 4 of whom drive the Circulator. Drivers can have as many as 14 passengers on their bus at one time all going to different locations. There are vehicles in the system with well over 400,000 miles driven. On the first day of service, the Solid Ground Circulator carried only 74 riders. Today, they average over 300 riders per day. The longest routes will drive over 300 miles in a single day. SGT employees represent over 30 different countries around the world! They are our family describes a day in the life of an ACCESS driver, and the passengers who depend upon this service. A really good marriage highlights the 45-year marriage of Solid Ground Transit employees Ninus and Kathy Hopkins. Driving from the Heart & Out of Love is a short video showcasing Ninus and Kathy’s devotion to their selfless work and to each other. They have been driving the elderly and people living with disabilities to appointments throughout Seattle for over 26 years, and as a mixed-race couple, they have endured countless acts of prejudice and racism. Still, they serve in a spirit of community and love.